The challenges facing patient care go far beyond issues of EHR interoperability. Patients eat, drink, exercise, do home testing, take prescriptions and talk with friends and family in a plethora of ways that have nothing to do with doctors – so can all those everyday moments that don’t happen in a clinical setting be collated to keep chronic conditions in check? Sumit Nagpal and his co-founders have been thinking and working on those questions for, oh, about 25 years now. Thus, LumiraDx, the latest iteration of their ideas, could be thought of as an overnight success that’s been two decades in the making, as customers are rapidly coalescing in their recognition of the transformation of patients’ lives that is possible with this new firm. 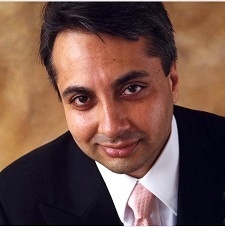 Nagpal, Chief Architect of U.K.-based LumiraDx Holdings, and CEO of its U.S. unit located in suburban Boston, says to think of their offering as an “overlay” on top of existing systems that address needs inside the four walls of hospitals and physician practices, but currently in a siloed way. LumiraDx uses data from these systems, and joins it up with information from point of care and home-based diagnostic devices, social care systems, personal-activity trackers including wearables, and even social media to personalize and customize care solutions. Are patients adhering to their medication schedules? Are they getting depressed and unable to do the things that will improve their well-being? Do they feel positive about their health? “All of that can provide context and inform us as we then work to help these individuals slow and perhaps turn back the progression of disease,” Nagpal says. The successes are adding up quickly. Richard Branson’s Virgin Care rewarded LumiraDx with a national contract in England to help the company manage and improve outcomes across the high-risk populations it serves. That’s on top of LumiraDx’s contract with the National Health Service, the national payer for England, to join up health and social care data for the entire population of greater Manchester, affecting 2.9 million lives. Another contract with a major corporation will soon bring LumiraDx into 12 more countries in Western Europe and Scandinavia. And other agreements are in the works, including in the U.S. market. • Providers that have figured out that a focus on improving outcomes is the only path to surviving and thriving in the new emergent models of care. • Payers, both private and public, that have taken on an active role helping their members create those kinds of outcomes. • Employers who might be self-insured, acting as payers with a vested interest in helping their employees live healthier lifestyles and achieve better productivity and outcomes because of that. LumiraDx, Nagpal says, aims to go beyond, say, a simple glucose test at home. The importance of physicians and caregivers in Nagpal’s world comes from his father, who is an MD. “If I go back in time, my interest in healthcare really did arise from being fascinated with what my dad does,” he says. “He evolved from being a doctor to managing hospitals to being involved with the public health status of large populations. I grew up in these organizations. As an entrepreneur, Nagpal bears the influence of another leader, Steve Jobs, for whom he consulted when Jobs was creating NeXT in between his stints at Apple. Nagpal is perhaps more low-key than Jobs but earnestly wants his products to become nothing less than an omnipresent strand in the fabric of healthcare. The path from a driven, college-age CEO to his current role has been a journey in leadership, Nagpal says. “Leadership is both about leading and but also massively about enabling people you work with to also lead,” he says. “It’s not a cult of personality; it’s a team sport. If I had to make a choice between trying to do it all myself or doing it with people who have an incredible pool of knowledge, experience, talent and leadership, it’s a very simple choice.